Submarine Salad: You Won’t Miss the Bread! The best part of a sub sandwich is the meat and veggies and abundant Italian dressing. You have all those in this tasty Submarine Salad, so good you won’t miss the bread! Ready for a salad to knock your socks off? This Submarine Salad is it! I’ve been making it a lot this past few weeks, and can’t tell you how very much I love it. 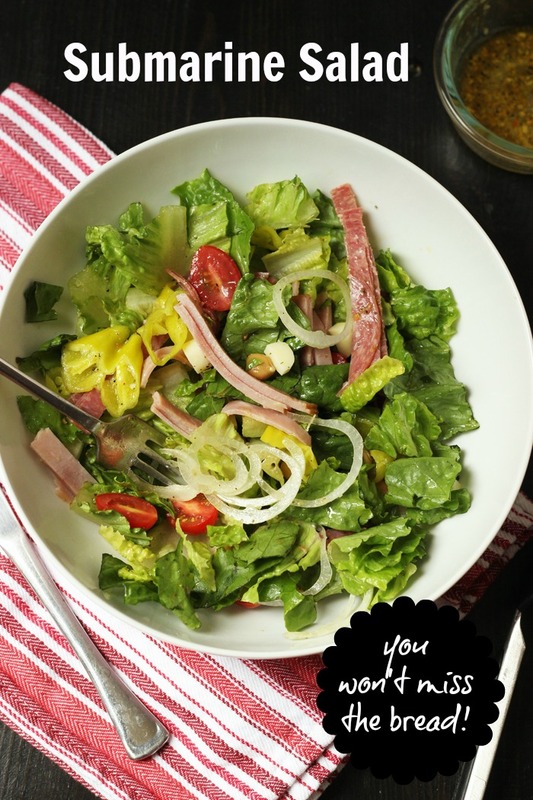 If you are a fan of the classic submarine sandwich, then this is the salad for you. Let’s consider the submarine sammy for a moment. The best part is typically not the bread. Unless of course, you make these homemade sub rolls. But, if you don’t have the time or it’s too hot to heat the oven, you’re stuck with shoddy store bought rolls which generally aren’t all that great. Rather than make a sub on a mediocre store bought roll, I’ve taken to put my submarine in salad form. After all, the best parts are the fillings, are they not? Savory meats, hearty cheese, spicy onions, tangy peppers, and juicy tomatoes. YUM-O, as they say. This Submarine Salad is, as my sister would say, the bomb. It’s cool, it’s fresh, it’s full of flavor. I am loving this salad for easy summer eating. It’s easily packable for work or play, and it’s full of great flavors. The submarine kind of flavors. This Submarine Salad is the perfect gluten-free alternative to a traditional sub. Yes, I did throw in some garbanzo beans, because really, garbanzo beans make every thing a little better. Okay, not everything, but they do add a little something to this salad. Typically, I focus on as many organic and whole foods as I can. 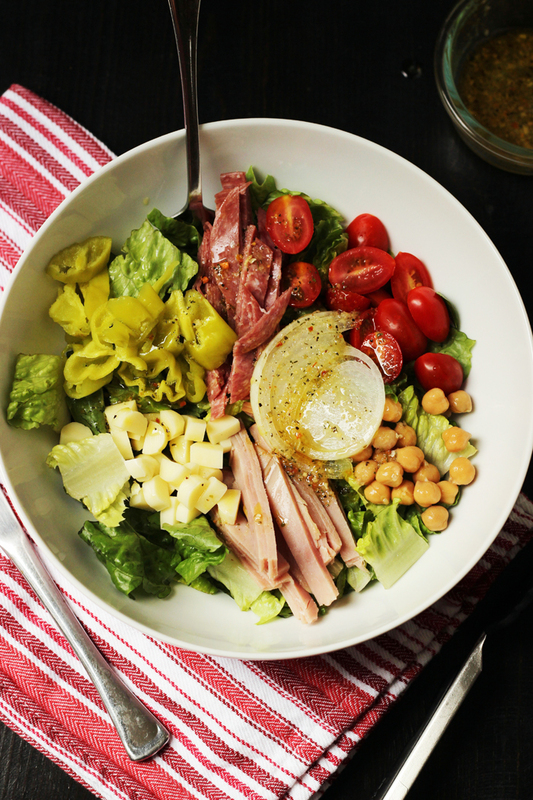 In the case of this salad, you do have a few items that are on the “unhealthy” side. Most people would agree that pepperoncini and cold cuts don’t rank too high on the healthy side. Phooey. I try to minimize their “badness” by buying uncured meats whenever possible. The pepperoncini are a pickled pepper. Sometimes manufacturers add food coloring to enhance the yellow hue. If you can, buy them without that or make your own. But, for once in awhile eating, I don’t worry too much about it. For the vinaigrette, I use my Basic Vinaigrette recipe, often using white wine vinegar, Jamie’s Spice Mix or Trader Joe’s 21 Seasoning Salute, and olive oil, but you can use your favorite vinaigrette. Six-packs of romaine lettuce at Costco cost about $3. They end up costing 50 cents each. Cutting my own lettuce results in a fresher salad than if I buy the bagged or boxed variety, particularly in summer when those items tend to “go off” pretty quickly. I buy grape tomatoes on sale, especially in the off-season. It seems that grape tomatoes are pretty decent year round while whole tomatoes can be mediocre when out of season. And even in summer, grocery store roma or slicing tomatoes aren’t all that great. With onions as low as 25 cents/pound at my local Sprouts market, I make them a pantry staple, so I pretty much just buy a ton when I see a good price. For this salad I try to buy “sweet onions” or rinse regular onions in cool water after I cut them. This tends to “deflame” them a bit and take out the bitterness. when I see the better brands of cold cuts on sale at my regular grocery stores, I buy stock up. Same with the pepperoncinis and garbanzo beans. salad spinner – This is a great tool to use when you prepare salad greens yourself. Spinning off the water extends the shelf life of your salad greens. I bought this one last summer and it easily holds 2 to 3 heads of romaine. fine mesh sieve – Perfect for rinsing beans. I bought this set in April and love it! 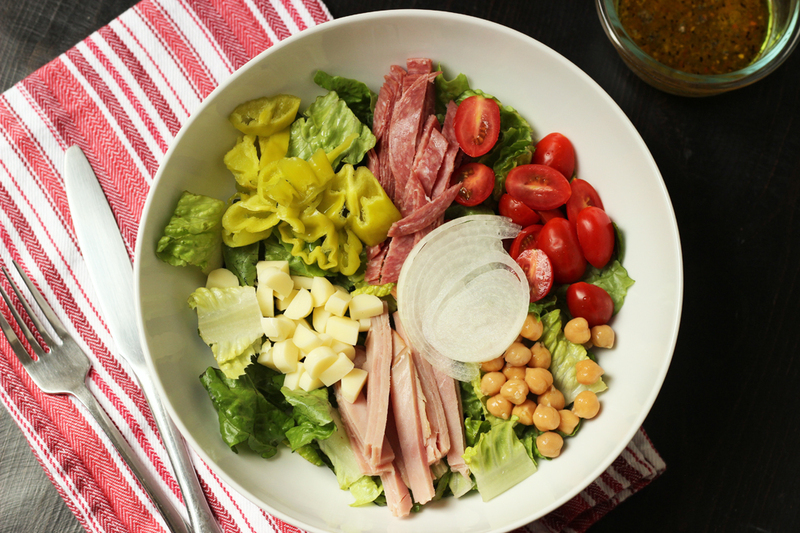 Divide the ingredients among four large dinner bowls, layering romaine lettuce, garbanzo beans, salami, ham, tomatoes, cheese, peppers, and onion. Serve salads with dressing on the side. Oh my! This looks sooooo delicious. I wouldn’t miss the bread at all? You are so right–the best part of a sub sandwich is definitely not the bread. And I love your tips for keeping it cheap. Also, my local Aldi has some amazing lettuces that are pretty cheap. The variety pack of red and green “Artisan Lettuces” is amazing: fabulous quality, great flavor, and lasts for about a week. We made this tonight and it was delicious! We set it up as a salad bar and everyone had their personal salad! This was great! I had tomatoes, lettuce, and pepperocinis in the garden so it was beyond cheap! I added pepperoni too because, why not? Thanks! Yes! My favorite childhood restaurant added pepperoni and other Italian cold cuts to their salad as well.